Paul Madonna is an award-winning artist and writer. He is the creator of three series, All Over Coffee (San Francisco Chronicle 2004-2016), Small Potatoes (Universal Press Syndicate), and Quotable City (Nob Hill Gazette 2018), and the author of four books, All Over Coffee (City Lights 2007), Everything is its own reward (City Lights 2011), On to the Next Dream (City Lights 2017), and Close Enough for the Angels (Petty Curse Books 2017). Paul's drawings and stories have appeared internationally in numerous publications such as the Believer and zyzzyva, as well as in galleries and museums, including the Oakland Museum of California, the San Francisco Contemporary Jewish Museum, and the William Blake Association in France. Paul regularly gives lectures and presentations at universities, including Stanford, Academy of Art, and California College of the Arts, as well as at libraries and for private organizations. Paul's work has been made into murals for private and corporate clients such as Tacolicious, Google, and Starbucks, as well as printed onto chocolates, dresses, and hats. Paul holds a BFA from Carnegie Mellon University, and was the first (ever!) Art Intern at MAD magazine. He was a founding editor for therumpus.net, has taught drawing at the University of San Francisco, and frequently lectures on creative practice, even when not asked. Paul is available for private commissions as well as speaking engagements and presentations. "Absolutely stunning… an all new art form." "Deeply satisfying… Madonna’s prose is magnificent"
"Miraculously exquisite... dreamy and surprisingly emotional." 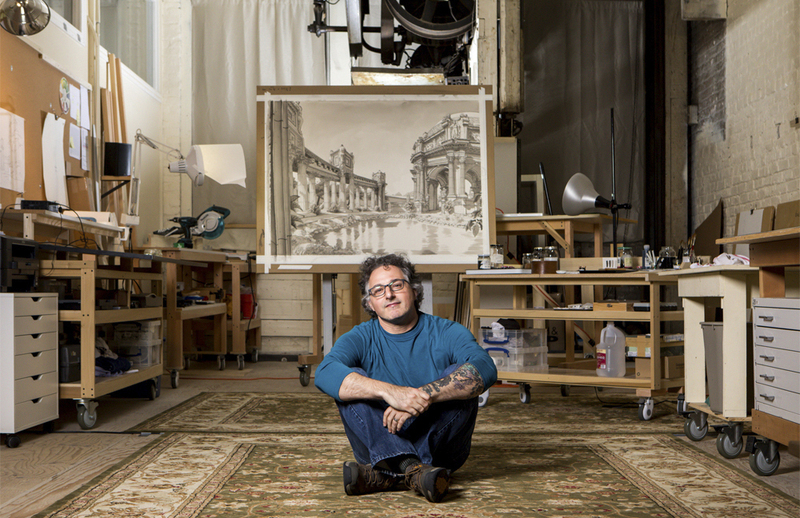 "Paul Madonna is a pen master. His work is difficult to categorize but that he was MAD magazine's first art intern may help explain his ability to capture human experience in its odd fullness." “Check out Paul Madonna's surreal guide to the city's zeitgeist, a sketchbook of "sideways" cameos in ink-wash drawings of San Francisco's eccentric architecture and streetscapes, captioned with poetry, haiku or overheard conversations." "Simply delightful. I really don't like much out there, I really don't, but On to the Next Dream I couldn't put down. It was sharp, clever, honest and maybe the funniest book on eviction ever written." "About detail, willful eccentricity, an almost rococo approach to line, and a steadfast devotion to art for its own sake, beauty as its own reward. Paul Madonna's work gives itself fully to all of these notions." "Madonna has created a kind of San Francisco Realism, details so absurd, cruel, and beautiful that they can only come from our infuriating home. If Charlie Kaufman squatted in an illegal sublet in Armistead Maupin's mind, this would be the lovely tenant." "Paul Madonna has not only pressed graphic fiction way beyond its present boundaries, he has created a new and stunning art form where the stand-alone brilliant visuals and the hauntingly human words synthesize into a pure and irreducible aesthetic vision. This book taught me something fundamental and true and beautiful about the ineffable thereness and thingness of life. Everything is its Own Rewardis a work of genius." "Paul Madonna's On to the Next Dream is bleak, terrifying, hilarious and lovely." "For years I've been intrigued and charmed by Paul Madonna's careful and thoughtful drawings of overlooked nooks and by-ways of San Francisco. In his new book he now combines them with manic, delirious, and increasingly paranoid writings as he struggles with the all-consuming City dilemma of gentrification; of who came first, who gets to stay, which wave of usurpers is more 'real' and deserving than the next, and finally, what happens when someone decides it’s your turn to go. Beautiful and engaging." What Better Way to End the Festival?